* This method only approximates joint non-normal draws (which is really what any method does). 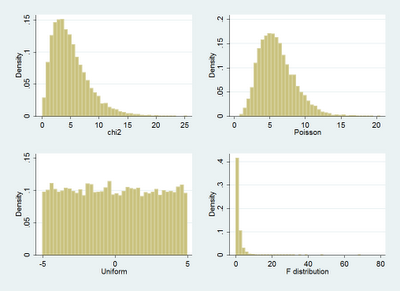 * I was recently told that it was "impossible" to draw joint non-normal distributions. * But you will see that the approximation looks pretty good. * It is easy to draw jointly distributed non-normal draws so long as you can start by drawing jointly distributed normal draws. * Looking good. The next step is that we take the inverse CDF of the distributions of interest. * The inverse poisson distribution seems to be incorrectly defined in Stata so that it uses 1-p rather than p to calucalate the inverse. label var z4 "F distribution"
* We can see that the spearman rank correlation is maintained with the standard pearson correlations are only slightly diminished by the non-linear transformations. * In general the correlations are slightly drawn towards zero so if possible it might be worth it to exagerate the correlations in the matrix c so that they end up being drawn more closely to the desired levels. 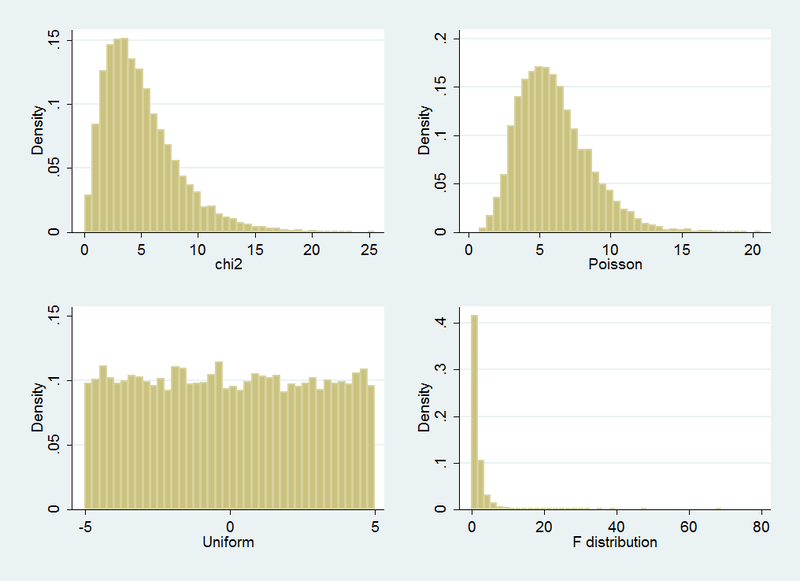 * Much of the content of this post was covered in a previous post under the title: Drawing Rank Correlated Random Variables. It might be worth looking over the previous post if you have additional questions.